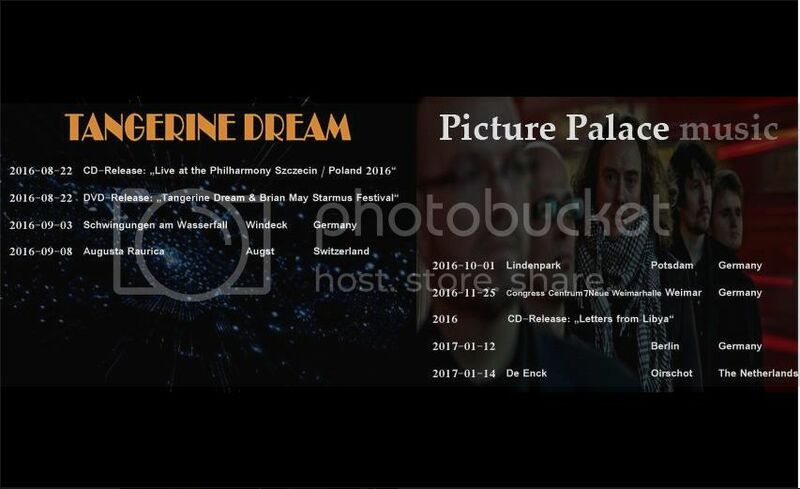 2016-08-22 CD release: "Live at the Philharmony Szczecin / Poland 2016"
2016-08-22 DVD release: "Tangerine Dream & Brian May Starmus Festival"
There is a link to a promo clip on Youtube too. I have spoken to CD Services and they have not been given any release dates for this DVD and CD. They have not, as yet, been given the full track details for the CD either, so they think it is unlikely either will be released on 22nd August. They believe those were the original dates suggested but that it will now be later than that. As we are not getting any info here on the site, it is all just guess work at the moment!! What a pity that the OFFICIAL Tangerine Dream website does NOT contain the latest info on the band, releases, concerts, etc. Yes, it is a pity. I know that they have the Sep16 concerts coming up and are working on the documentary and the, hopefully, upcoming releases, but it would only take a few minutes to post a few updates and would put an end to all of us guessing. A Newsletter email is another option which surely wouldn't take too long. It's just the not knowing which I find very frustrating!! This is not true. There are 2 concerts on Sep. 3 (Windeck, Germany) and Sep. 8 (Augst, Switzerland) announced. They were only put on a while ago after I said on the Forum that there was no mention of it on the website!! PS: A NEWSLETTER TO ALL SUBSCRIBED WILL FOLLOW!! I just ordered the new releases. Thanks for the info, EB. Thanks EB. Have just ordered both and look forward to seeing and hearing them soon. Am looking forward to receiving these new releases, hopefully in the next few days. Can't wait to see the Starmus concert at last, especially as it is probably the last concert DVD to be released that features the late great Edgar Froese!!. Nothing arrived as yet, which is a shame because I was looking forward to watching the DVD over this coming weekend. Have a few hours left for it to arrive today but not looking too hopeful. Of course, I do not know if they did start shipping last Monday as stated!! Oh well, keeping fingers crossed. I would have bought the download version of the Quantum Years concert while waiting for the CD. Unfortunately nothing in the download shop yet.